The human foot is a marvel of complex engineering. Each one is made up of 26 bones, 33 joints and over 100 soft tissue structures that form muscles, tendons and ligaments. Not to mention the 150,000 nerve endings that you have on the bottom of each foot. Your body needs all of those components to be working at full capacity in order to achieve an impressive vertical jump, sprint or deadlift. But more often than not, your feet have lost that ability, and the negative consequences can be far-reaching. Indeed, progressive doctors that specialize in treating jaw disorders (e.g., TMJ) look at the patient’s foot posture and control when designing a treatment plan. Many active people take up to 10,000 steps per day. Pair that with the fact that most people don’t wear properly-fitted shoes, or have stiffness in one or more of the 33 joints, and you’ve got a perfect scenario for lousy foot mechanics that can cause ankle, knee, low back or the previously mentioned jaw pain. Shoes are often the culprit, because they impair isolated action of each toe. And if you wear high heels or cowboy boots, the situation becomes exponentially worse because your toes are crammed together like clowns in a compact car during a Shriner’s parade. This results in poor motor control of your feet – essentially, your feet become “dumb” since your brain loses the ability to effectively control their joints and soft tissues. Here’s a simple, basic test to determine if you have adequate motor control of your feet. Stand barefoot with your feet shoulder width apart. Can you lift the big toe without elevating the other four toes? Can you elevate the four smaller toes while the big toe remains on the ground? If you weren’t able to pass the test, your feet lack the motor control they need. Practice this drill throughout the day while seated, and then progress to the standing version since it’s more challenging. It will probably take a few weeks to get it right, and at first you might need to use a free hand to hold down the toe(s) that should remain static. The next step is to focus on the shoe dilemma. Remember, regular shoes will keep your toes from moving freely. 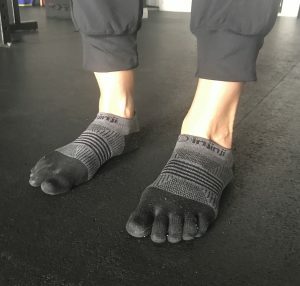 The solution is to wear toe socks, which isolate the toes so your brain can reconnect with each one. You can find them on Amazon at this link. 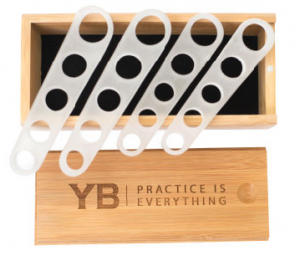 And for the times when you want to walk or lounge around the house barefoot, you can find rubber toe spreaders on Amazon at this link. Now you have a simple way to test, and improve the motor control of your feet. And when you don’t feel like practicing the motor control drill, be sure to wear toe socks or rubber toe spreaders so your toes can come back to life. Your ankles, knees, low back – and maybe even your jaw – will reap the rewards. You may want to look at Xero Shoes — shoes and sandals designed to let your feet move and flex naturally and with soles that give ground feedback + protection. Great to see you updating Chad, I am becoming a big fan of your work, and you are one of the few people who put out novel and interesting ideas. Perhaps school was taking up all your time. Working my way through your “back catalog” of articles, workouts, and protocols and liking them a lot.